For authentic, light as a cloud gnochi, you go to an Italian restaurant, for a banging curry, the local Indian. For dim sum, you’d search out a Chinese restaurant and for a great Sunday roast, you need a great British pub. Why would you go to those places? Because they have a specialty, they are experienced in making those foods. They have honed their skills. You know they have trained and experienced chefs, not someone that knows how to operate a microwave. You can get Chinese, Italian, Indian and British food - and many more types of food in Wetherspoons, but if you fancied an Indian meal it wouldn't be your first choice (even on a curry night!). Well, because you know the curry you get there isn’t a freshly prepared, authentic curry with all the trimmings made by a chef trained and skilled in the fine art of blending spices. What Wetherspoons IS good for is good value food, with a huge menu choice to suit all tastes, from wraps, burgers, steak, breakfast, pies, fish and chips….you get the picture. So when you go to Wetherspoons to eat, it’s functional. The food’s fine, but you wouldn’t expect many guys taking their girlfriends there to propose. Are you a therapy ‘Wetherspoons’? When someone lands on your website or directory profile, does it read like a Wetherspoons menu? Do you go through the alphabet of issues: Abortion, Abuse, Addictions, Adoption, ADHD Anxiety, Abduction by Aliens etc? Do you offer to work with kids, couples, groups, corporate, schools, EAP? Think for a moment - what does that say about you? Remember the phrase ‘Jack of all trades’? Do you remember the next line? It’s master of none, and that’s the issue here. People want to see someone that's best suited to help them, an expert. And although as counsellors we shy away from the word expert, unless we have a specialty we're letting people skim our profile/website and then move on to the next one, the one that does have extra training, experience and skills that make clients feel confident they can be helped. Because if you’re going to put your story, your secrets, your fears, your mental health into someones hands, you want those hands to be the safest hands you can find. Longer answer: no, you won’t. Even longer answer: honestly, no, you really won’t so relax! Because there are plenty of people out there needing help. We’re told 1 in 4 people struggle with a mental health problem at some point in their lives. That’s a whole lotta people. But as therapists we don’t only see people with mental health problems, we see people that are feeling confused, have been bereaved, are trying to cope with difficult feelings, struggling with communication, are being abused, victims of attacks etc. As you know, you don’t need a mental health problem to benefit from therapy. Let’s look at my niche - relationships with food. How many people have difficulties with food, eating, weight and size? Let’s put a conservative estimate of 1 in 20. Multiply that up, and that’s 1,000 people in 20,000. Think of the area you serve and the population there - I just googled the population of Lincoln, and the 2011 census says 130,200 people, and I also have clients from Newark, Gainsborough, Retford, Market Rasen... you get the picture. Maths was never my strong point, but that’s a HUGE number of potential clients! Just a small percentage of them would keep me happily in business. 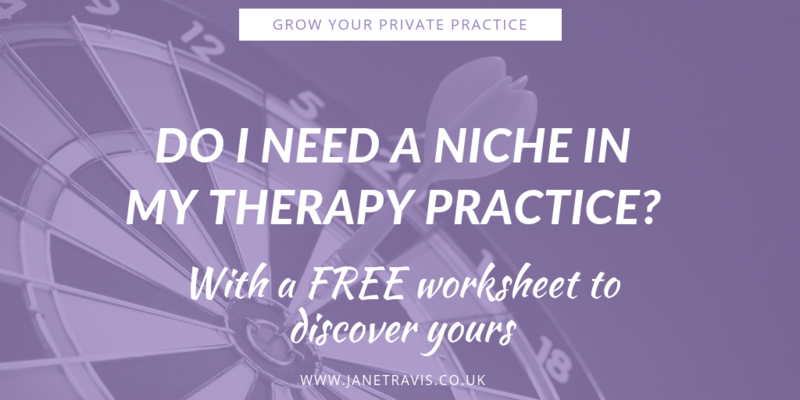 When is the best time to choose a niche in my counselling practice? 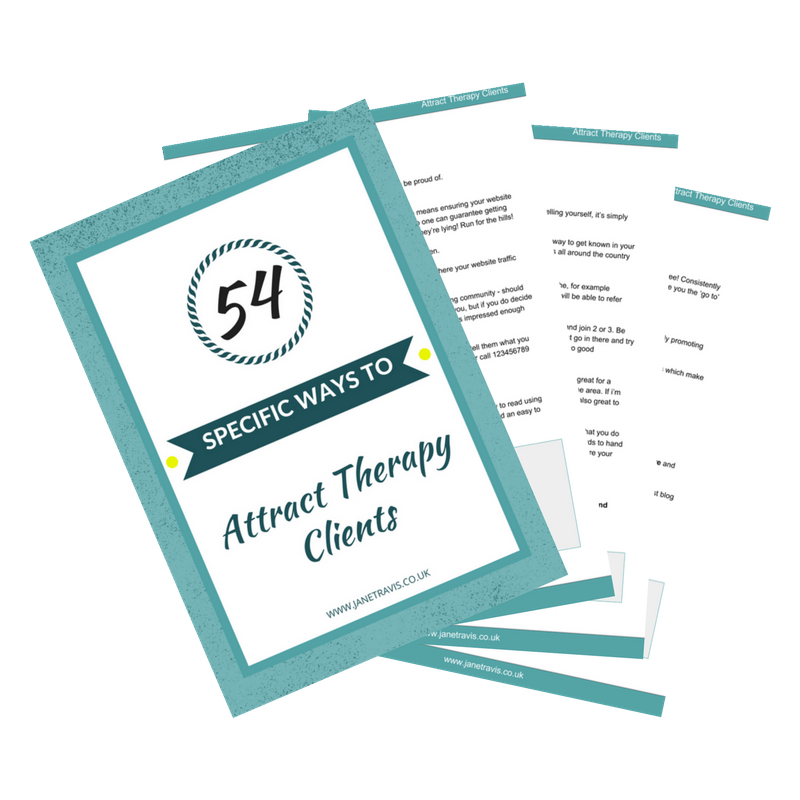 I don't have to tell you that none of these things come cheap, so it makes sense to concentrate on targeted training that will improve and increase the skills in your chosen niche, and target advertising towards your ideal client. What makes this really really REALLY brilliant is - it means you serve your clients better. Your clients will get the help they need and leave satisfied. Satisfied clients tell other people, and go on to refer you to family and friends, leading to word of mouth referrals. 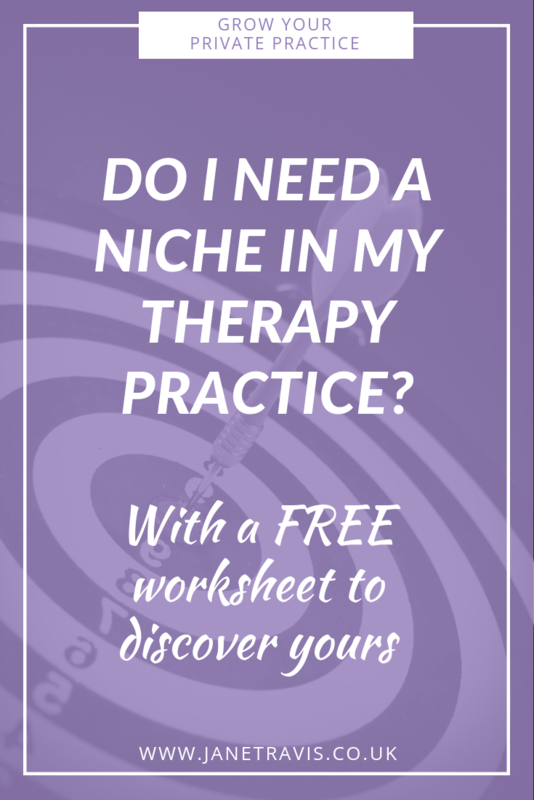 Which leads to variety in your practice, de-bunking the myth that specializing means you always work with the same type of clients. You'll be more effective as a counsellor, have greater job satisfaction and help more people. Isn't that why you became a counsellor in the first place? This is vital, because if you love what you do, you'll never have to work a day in your life. As counsellors, we really are passionate about what we do, so picking a speciality that you're passionate about means ​you're going to be really good at what you do. Training, CPD and working will inspire you. When a client has a positive experience of counselling, it benefits the profession as a whole. More positive experiences = more positive feedback to friends/family = more people accessing counselling. When wouldn't I want a niche? ​If you live in a remote area that's not populated with other counsellors, and if you want to, you can go without a niche and serve the community. But even then, having a focus and learning about and working with the people and issues that you're passionate about will leave you feeling more fulfilled. Yes, we need to earn a living ​but morally and ethically we should be working with people within our competency. Remember, you can always change your speciality in the future, and it doesn't mean you never work with other issues. So don't be Wetherspoons, get a niche!